Shemanski Park Farmers Market is a popular lunch and shopping destination for downtown residents, office workers, tourists, and local chefs. Founded in 1998, this gem of a market features 50 vendor stalls filled with farm-fresh and locally-made food under a lush green canopy of trees. This market accepts cash, credit cards, SNAP, WIC and Senior Farm Direct vouchers, Veggie Prescriptions, and Sisters of the Road Fresh Change. 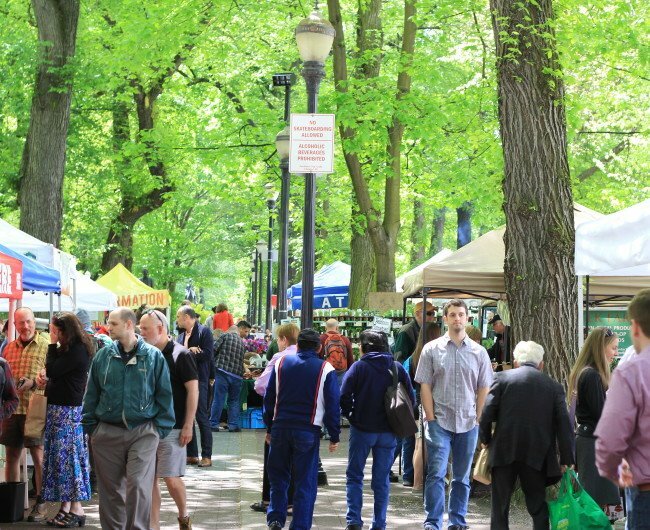 Shemanski Park Market is located at between SW Main and Salmon Streets across the street from the Portland Art Museum and behind the Arlene Schnitzer Concert Hall. ADA accessible entrances are located along Main Street. On-street parking and several parking garages surround the market. Click here for rates & location information. Covered and uncovered bike parking is conveniently located near several market entrances. For additional information about biking in downtown Portland, click here. The Shemanski Park Farmers Market is open on Wednesdays, from 10 am to 2 pm, from May thru October 2019. A one day only, pre-Thanksgiving Farmers Market at Shemanski Park, on Wednesday, November 27, from 10 am to 2 pm.